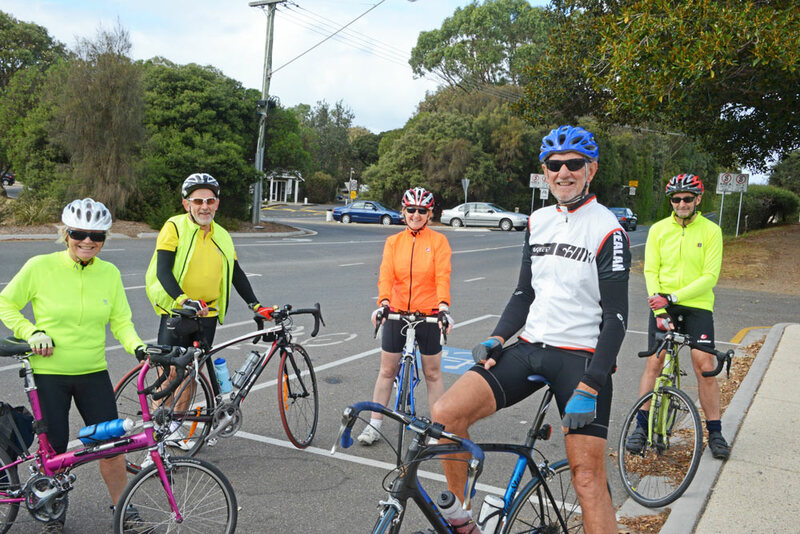 Five riders set out for this delightful circuit of the inner Bellarine – Helen and Doug from Cycling Geelong and Peter, Ross and John H (ride leader) from GTC. Comments were made about the state of Barwon Heads Road. There was heavy traffic and, with more housing popping up all the time, duplication is long overdue. Lake Road was a welcome relief – not a car in sight. John raced ahead on 13th Beach to take some photos. Rosemary Hogan joined the group briefly at Barwon Heads. The ride through the back streets of Ocean Grove backfired when Thacker Street was approached – about half way up the steepest hill. John ground to a halt, with Doug hitting the deck in sympathy – and elbowing the road rather vigorously. Score – Road 1, Doug 0, Bike 0. Undaunted Doug set off stoically for coffee at Van Loons – where he administered first aid. On the way the group detoured into Oakdene to look at the sculpture and select new bikes. Coffee was welcome – and various goodies were consumed to compensate for Thacker Street. The coffee, at $5 for a mug – while good, stung almost as much as Doug’s elbow. The ride home along Portarlington Road and the Rail Trail was uneventful (at least as far as Moolap Station Road where Ross and Helen went their own ways). Thanks to John for another excellent joint ride. This is a delightful route – suitable for most riders. 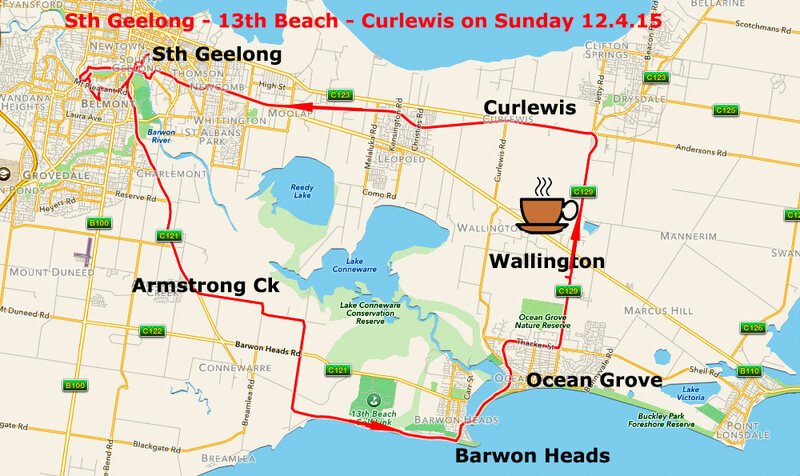 Next month is Cycling Geelong’s turn to lead the ride. Why not join us? 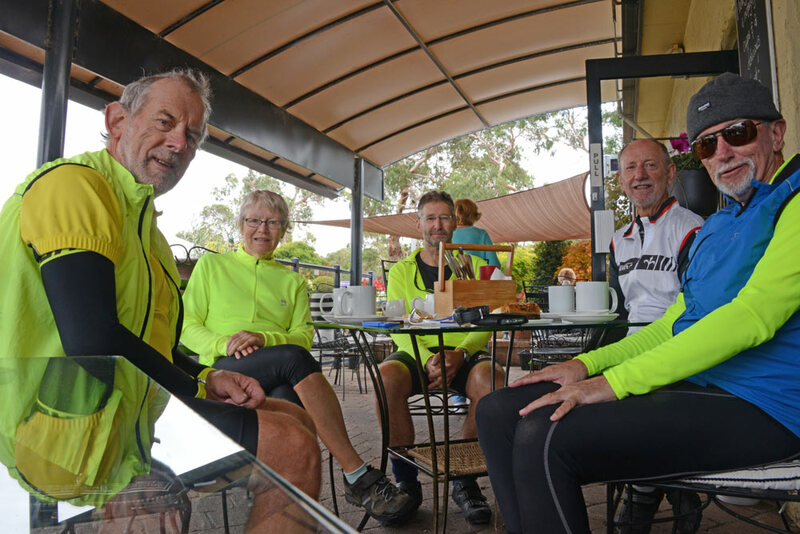 This entry was posted in Ride reports, Uncategorized and tagged Bellarine Rail Trail, Van Loons Nursery by hlyth2013. Bookmark the permalink.